Before getting to the point, I am just going to digress for a moment, to explain how the name of my biz came about and what it means to me...it’s about way more than food. 1. uncooked, as articles of food: a raw carrot. 2. not having undergone processes of preparing, dressing, finishing, refining, or manufacture: raw cotton. 1. freedom from external or foreign rule; independence. 2. freedom from control, interference, obligation, restriction, hampering conditions, etc. ; power or right of doing, thinking, speaking, etc., according to choice. I started eating more raw food in 2006, my intention, solely I thought, naively I now realise, was to gain more energy, improve my health, feel and look better, and lift those ever increasing ‘dark’ days – you know the ones, when you wake up feeling totally shite, and wishing you didn’t have to face the day. What I didn’t realise, and certainly didn’t expect, was that it would open me up to myself, give me a clarity I never thought possible, clarity about who I was, and who I was becoming, and what I wanted out of life. Raw food is not just about the food, it’s a whole person journey. It can open up the potential for you to grow at a different rate or perhaps in a different direction than you had been before. And if your partner is not growing with you, this ‘stuff’ is bound to affect your relationship to some degree. And so came the realisation that I had spent so many years trying to be someone I’m not in order to be ‘the person’ someone else wanted me to be...and what’s more, I was failing miserably at it! Worse still, I realised that I was losing me, my true self in the process! ‘It is very romantic to say that you were ‘nothing’ until that special other came along, but it is not true. Worse, it puts incredible pressure on the other to be all sorts of things he or she is not. Not wanting to “let you down” they try very hard to be and do those things until they cannot anymore. They can no longer complete your picture of them. They can no longer fill the roles to which they have been assigned. Resentment builds. Anger follows. I lost count of the times I heard the phrase “Other people’s wives...” and rather than listening to my spirit which was screaming inside – “...but I’m not ‘other people’s wives’, I’m ME!”, I would dust myself down and try again to be someone I’m not. The clarity I gained from eating a high raw diet, showed me that, in this internal struggle, I was actually losing, losing myself, losing me. Another digression, sorry...For me, ‘raw’ and ‘liberty’ mean just that...a freedom to make choices. Having the freedom to choose what we eat, how we feed our bodies. In our society today we are literally swamped by food choices, from quick and easy fast food takeaways and microwave ‘ding’ meals, through a whole gamut to fresh organic fruit and vegetables. The spectrum is vast, overwhelming in fact. Ever been out for a meal and been faced by so much choice on the menu that you just didn’t know what to order? For me, food, the way we choose to nourish ourselves is all about that; CHOICE. It is my choice at this point in my life, to eat a high raw diet; it serves me, my body loves it, I feel more alive, and so much happier. But it is a choice, I’m not a purist, I don’t preach...If I wanted to eat a steak tomorrow, I could. (Chances are pretty damn high that I won’t, but if I chose to ...that is ok) So I made a personal choice to eat raw food. I have never pushed my choice on anyone else. I will cook meat, fish, dairy, for others if that is what they choose to eat (although I would prefer not to...) I respect their choice to eat meat etc. and will not push my choices on them; in return I would like my choices to be respected. I won’t ask or expect them to eat raw, as long as they don’t ask or expect me to eat cooked....We all have a right to freedom of choice don’t we? ...So back to his declaration; the one about not ‘being married to someone who eats raw food’. Now here’s a lesson in the need to be specific in what you put out to the Universe, because the Universe, in all its glory will deliver! Five years later, his manifestation has come to fruition...we are no longer together. 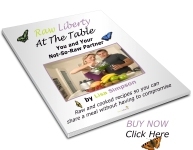 So...did raw food end my marriage? Make me single? I think, for the most part, no. There were so many other contributing factors at play, which I won’t go into here for personal reasons, but the part raw food played in all of this was that it brought with it clarity, clarity to realise that I was losing the one thing that was truly mine, ME!, and that I had a choice – give up who I am and live my life trying to be someone I’m not, in vain attempt to make someone else happy, or be true to myself and live my life as ME. Is that really a choice? Simple as it may sound, it was the hardest choice I have ever had to make in my life, and believe me, it took years of heartache and soul searching to find the courage to take that leap of faith and believe in me, that I have a right to be me, that I am worth it. This is me damn it! I look the way I look, think the way I think, feel the way I feel, love the way I love! I am a whole complex package. Take me... or leave me. Accept me - or walk away! Do not try to make me feel like less of a person, just because I don't fit your idea of who I should be and don't try to change me to fit your mould. If I need to change, I alone will make that decision. And so here’s to Raw Liberty...freedom to be who I am, to stay true to myself, me, stripped back to who I am. I have committed to being myself (I can’t be anyone else, I’m a crap actress!) and so from now, anyone who comes into my life will have to take me as they find me, love me as I am.. Known for my love of green smoothies, so I'm very excited to have been invited to join the Green Smoothie Queen log team! We’ve all heard the sayings, “Eat Your Greens” and “Greens are good for you”, but do you really know how true it is? Greens provide us with one of the most perfect forms of nutrition we can consume. They are loaded with amino acids, (the building blocks of protein), minerals, vitamins, fibre & chlorophyll. In fact the chlorophyll – the green pigment of a plant – is biochemically almost identical to human blood! This just makes it our perfect food! According to Victoria Boutenko greens are the primary food group that match human nutritional needs most completely. Our bodies require a certain amount of nutrients to thrive. In drinking or eating something that is packed with nutrients you will find that you will be satisfied throughout your day and your cravings will be reduced accordingly. Greens can be combined with any other food and enhance digestion by stimulating enzyme production. Therefore, the combination of greens and fruit in green smoothies is an ideal combination. Green Smoothies are smoothies that are made with blended fresh leafy greens. It’s as simple as that. Often the greens are blended with fruits, which provide you with a delicious meal bursting with nutrition! However, as fantastic as greens are, we would have to chew them for ages in order to get them to the creamy consistency that is necessary for us to be able to take full advantage of all the nutrition they hold – the nutrients are stored within the plant’s cells and their cell walls need to be ruptured in order to release them; that’s where the smoothies come in. By blending your greens in a high speed blender, they are broken down at a cellular level which not only releases more flavour, it also makes the bounty of nutrients more readily available for your body. So, what can Green Smoothies do for you? … and the positive benefits goes on. Green smoothies do look green admittedly, but they taste delicious and tend to take on the taste of the fruit in them. It is generally recommended to use 40% greens and 60% fruit, but of course you can vary this depending on taste preferences! You can use any green: experiment yourself, however, don’t use the same one all the time. It is important to rotate your greens to get a variety of nutrients and to respect the seasons. If you can’t grow your own greens, try to buy organic greens, they won’t contain pesticides and herbicides and will contain more nutrients than non-organic greens. If you can only buy non-organic, make sure you thoroughly wash them before blending. This is my tried and tested recipe, specially for beginners. Blend, just long enough to make it smooth and creamy without heating it up and ENJOY! By now, hopefully, you are excited by the positive benefits of green smoothies! So, I challenge you to replace at least one meal a day for 24 days with a green smoothie, on the upcoming 24-day Countdown to Christmas. Good luck! I’ve just returned from a truly relaxing holiday in Italy, and am missing the sun sooo much back here in the UK! We stayed in a remote and somewhat basic apartment with a beautiful wisteria covered balcony which gave us a fabulous view over the Sorrento coastline! Ideal for soaking in the sun, topping up with some much needed vitamin D, and relaxing with a good book! Usually on holiday we choose to self cater as it’s easier to meet everyone’s food preferences that way, my husband loving his meat and me loving my salads! But the apartment seemed to conspire against us this year…The hob was decidedly dodgy – you had to turn all four rings on in order to get any one hot and then they seemed to turn themselves off at will! The barbecue was only just big enough for a sausage and after waiting four hours to cook tea one night, we decided it was a lost cause! Not that it bothered me of course, but a plate of salad doesn’t go down well too with my carnivorous husband! Although, as always I took a good supply of flax crackers, granola, cookies etc and my trusty Tribest PB200, for making dressings, sauces and smoothies, they largely remained untouched! During the fortnight we were there I actually ate really simply with virtually no dehydrated food and I feel absolutely fabulous! There was such an abundance of delicious fruit and vegetables growing around us, just bursting with flavour! Oranges, lemons the size of grapefruit, peaches, kiwi fruit, tomatoes like I’ve never tasted before…. the list goes on… it was certainly no hardship to stay raw! I ate fruit for breakfast and lunch and in the evenings we ate at nearby restaurants which served locally grown produce. I have always found it relatively easy to eat at Italian restaurants in the UK and likewise, eating raw in Italy is just as simple, there was always a selection of insalata on the menu. I would order a couple of salads, simply dressed with lemon juice and olive oil, my husband could have his meat, and the kids loved the pizzas and pasta. All happy – no need to compromise! I’m off to Italy for two weeks, and looking forward to spending time in the sun, eating lushious fruit…. I absolutely love the Summer – feeling the warmth of the sun on my skin, spirits lifted, the World seems to be fully awake, and the fruit tastes so divine! There’s something about summer that brings out the intense fruit flavours. One of my favourite fruits is the mango, a real taste of summer! What I really love about this time of year is the fact that for just a few short months we have the opportunity to buy some of the best varieties of mangoes you could ever taste anywhere in the world. From April to August, we can buy imported mangoes air-freighted from the Indian sub-continent, which taste so much better than those we get from the main supermarkets all year round, which have been transported over land. At the start of the season Alphonso mangoes from India become available, then to my favourite – the honey mangoes from Pakistan which are available now. They taste sweetly honeyed and fragrant. As they are not picked until they’re perfectly ripe and ready, their bright, beautiful flesh is so much smoother and creamier than the standard mangoes you get in the UK. Over here in UK, as far as I’m aware, they are not available in the main supermarkets. Possibly this is because they do not have a long shelf life and do not have a the uniform unblemished appearance, which many people seem to require these days, at the expense of taste. However, they are available at many Asian stores found in larger cities. Honey Mangoes are very versatile and easy to enjoy – on their own, as a mono-meal, in fruit salads, or tossed with red peppers and lime for a tropical salsa. I made a heavenly mango custard by blending 1 banana, 1 honey mango, 1T lucuma available from Detox Your World, and a handful of goji berries. Eaten when sitting in the sun…bliss! I’m loving my salads at the moment, especially when eaten in sunshine! This is very simple and quick to make as no measuring is required! – Just how I like my salads to be. Toss several handfuls of mixed green leaves, whatever you fancy, with grated beetroot, diced mango, diced red pepper, diced avocado, chopped tomatoes and a handful of fresh sweetcorn. Put equal quantities of fresh orange juice and oil in a jar and shake. Pour over the salad. Toss and eat in the sun! Lovely! I like to use Braham and Murray’s Good Oil. It’s a pure, natural, cold-pressed hemp seed oil which contains omega 3, 6 and 9. These essential fatty acids (EFAs) cannot be produced by the body and must therefore be supplied by our food. Hemp naturally contains high levels of EFAs which are fundamental to human health. The balance of omega 3 and 6 is the same as that of our bodies which makes it easier to absorb. It also tastes delicious and is great for dressing salads!